And that's it. Man City made hard work of it, but they're still top of the league. Everything that happened in that game occurred in the last 10 minutes. That's it from me. For reaction and more live chat throughout the afternoon, head over here. Well, it should be three. Robbie Brady brings down Raheem Sterling with a tired challenge to give Man City a penalty. Aleksandar Kolarov takes it and drags it wide of the right upright. Martin Olsson has a late crack for Norwich and Joe Hart makes a really sharp save to keep him out. That will be all. Will it? For the second time this afternoon, Etihad Stadium erupted in mass relief when Yaya Toure dispatched his penalty but Manuel Pellegrini's men have continued to make incredibly heavy weather of this win - they have kept giving the ball away in stoppage time - much to the derision and frustration of their fans. "That's poor. Martin will be so disappointed, but also for his team-mates who have worked so hard to get back into this game. No one gave Norwich a chance and then they throw it away a few minutes from time. It's a great pen, calm as you like." Wilfried Bony gets in a good position again. Andhe fails to capitalise, again. Yaya Toure is going off, Martin Demichelis is coming on. Five minutes of injury time. Are we done yet? So much going on here. Norwich keeper John Ruddy goes walk about, giving Raheem Sterling a shot at an open goal. Russell Martin launches himself to block it but uses his arm - so he has to be sent off. Yaya Toure plants the penalty in the bottom-right corner. Joe Hart is the most relieved man in Manchester. Russell Martin handles in the area and it's a penalty to Man City. Martin is sent off. A stunned silence at Etihad Stadium, among the home fans anyway. The supporters in yellow and green are just as surprised, but are still bouncing up and down in delight. Norwich were not looking much like they were going to get an equaliser but Joe Hart's calamitous error gifted them a way back into this match. Oh my goodness. Joe Hart, England keeper, Mr Reliable, a safe pair of hands, has dropped the most spectacular of howlers. A Robbie Brady cross is heading harmlessly into his hands - but inexplicably he drops it at the feet of Cameron Jerome who prods into an empty net. Wilfried Bony would love a goal. But it looks like he might not get one. Gary O'Neil scurries to a block a shot from the striker. That's a booking for Cameron Jerome who catches Nicolas Otamendi. Classic striker's tackle that. Kevin De Bruyne, who has seen plenty of the ball, makes way for Fernando. Nicolas Otamendi had not scored a competitive goal for Manchester City before today - he has now. He did not have a song either, but that box is ticked too. The chant of 'Nic-o-las Ot-amendi' has been echoing around Etihad Stadium. It is fair to say that goal was greeted by as much relief as delight by the home fans but I got a very good view of Norwich boss Alex Neil with his head in his hands as his players trudged back to the halfway line for the restart. After the way they have defended today, it was a very soft one to concede. "It's a wonderful header, but if he had any hair Alex Neil would be tearing it out because Norwich have had a vulnerability from set pieces all season. They've been dogged but yet again conceded from a set piece." As much as you'd want Norwich to try and get back into this, you feel they'll do well just to keep it as it is. Wilfried Bony nods inches wide as Man City up the tempo. And immediately there's a bit more zip about the hosts. Aleksandar Kolarov whips in a cross that deserved a runner - it only finds John Ruddy. Meanwhile, Youssouf Mulumbu is spent, he is replaced by Gary O'Neil for Norwich. Man City fans need no longer be frustrated. They've searched so long for a bit of magic but this goal is as simple as you like. An outswinging corner from Kevin De Bruyne finds the head of Nicolas Otamendi on the penalty spot and it's planted past John Ruddy. The Manchester City supporters were pretty patient earlier but the atmosphere is getting more and more fraught at Etihad Stadium as the home fans realise time is running out to get a goal. They are urging their team to get forward quicker when they win the ball back, before Norwich can regroup, but so far they have not been quick enough, or accurate enough, with their final ball. Norwich will be wondering how many more minutes they can get from Youssouf Mulumbu, who ha been a rock for the Canaries. The former West Brom man is just back from injury. There were a few howls of frustration from the home fans when Manchester City went through a spell of about five misplaced passes in a row, but the tone is still more encouraging than critical as they watch their team try to break Norwich down. For example, a booming voice behind me keeps shouting "wakey wakey City" but, so far, the players have not responded. It seems they are waiting for someone to make something happen - will Raheem Sterling be that man? Robbie Brady gets on the front foot for Norwich and forces Fernandinho into some indecision. He panics a tad and bangs it out for a corner. Man City counter though, with Raheem Sterling carrying the ball, and it ends with a looping, wide effort from Yaya Toure. A goal for Man City is even more pressing, with Arsenal a goal up at Swansea and now top of the league. Time for the introduction of this man, as Man City look for something to unlock this Norwich organisation. Raheem Sterling comes on for Kelechi Iheanacho. An opening for Man City. Wilfried Bony is about to pull the trigger but Seb Bassong flies in with a superb challenge. Kevin De Bruyne picks up the scraps but whacks it wide. Norwich have actually had a slice of the possession this half, and Robbie Brady has a chance to get in a good cross. But it's the opposite of a good cross and straight at Joe Hart. I might just start making up stuff there's so little happening. Would you believe me if I said there was a unicorn the pitch? It's testament to Norwich's resilience though. It's Norwich who make the brighter start as Nathan Redmond bursts down the middle. But he just fails to put in Alex Tettey. Second half is underway. Can we expect goals. I bloomin hope so. Norwich have made a change - Matt Jarvis, who picked up a knock, is replaced by Nathan Redmond. Norwich's Youssouf Mulumbu made six tackles in that first half - twice as many as anyone else on the pitch. The cheers from the Norwich fans when Manchester City captain Vincent Kompany put a simple pass straight out of play just before half-time aptly sum up the first 45 minutes, which have been extremely frustrating from the home side's point of view - they have had almost all of the ball, but have done very little with it thanks to the Canaries' defensive discipline. Alex Neil gave a little leap in the air in anger when Cameron Jerome failed to react when Joe Hart played the ball short from a goal kick but, other than that, his side have followed his instructions to the letter. This graphic gives you an idea how that first half looked. Only two Man City players have spent most of their time in their own half. Only two Norwich players have spent most of their time in the opposition half. Not too much to see here folks. A couple of decent chances for Wilfried Bony. But Matty Jarvis came close for Norwich too, who have earned their 45-minute clean sheet. If you were to describe Norwich as parking the bus - and that would be a bit harsh - it would be a bus with leather seats, a luxury on-board bathroom and TVs in the back of the headrests. It's a classy bus. You know what this game lacks? Urgency. Well, it lacks goals, obviously. But also urgency. From the corner Vincent Kompany comes close. He connects with a falling-over-stooping header that squirms wide. Odd chance for Man City as Kevin De Bruyne is all on his own six yards out to get a header to a dinked Yaya Toure through ball. He can only loop it upwards though, and when Wilfried Bony nods it back to him, the Belgian is offside. Other than that show of respect, the crowd have been pretty muted. It's almost like they expect to bulldoze this Norwich side. The Canaries have been organised. Very organised. "It's interesting the way Norwich have set up with Brady, a left footer, at right back, probably to try and counter the threat of De Bruyne. Importantly they got through the first 15 minutes without conceding, now they're getting a little bit of confidence and occasionally posing a threat." Manchester City were already 4-0 up at this stage when Norwich last came to Etihad Stadium almost exactly two years ago, on 2 November 2013. Things have not been anything like as straightforward this time around. Fans hold a minute's applause in the 35th minute for Man City supporter Chris Shaw, who died aged 35 last week from cancer. Norwich boss Alex Neil has been patrolling the edge of his technical area, arms folded and barking non-stop instructions, since the game started. He seems to be staying pretty cool apart from two occasions - the first when Sebastien Bassong charged out of defence with the ball but gave it away tamely after making it to the edge of the home area - the other was when his side needlessly gave away a corner. On both occasions he turned to his bench, threw his hands in the air and - very loudly - made his feelings clear. I would hate to see his reaction if the Canaries make a mistake that leads to a goal. It's hit well by Yaya Toure and then saved equally well by John Ruddy, tipping behind and stopping it from going into his top-right corner. Awkward one for referee Robert Madley, who initially gives Man City an advantage for a foul on Kevin De Bruyne, but pulls it back moments later. Free-kick in a good position though. There is a noisy pocket of yellow and green behind John Ruddy's goal at Etihad Stadium, with a great view of how the Canaries are lined up to keep Manchester City out. The visitors' 5-4-1 formation has been ultra-organised so far and the home players always have another defender to beat even if they get past their man - and their supporters are cheering every tackle, not to mention when they threaten at the other end. And then Norwich go straight up the other end and come so close. Cameron Jerome lays it off for Matt Jarvis and Joe Hart acrobatically denies him. Man City are working it really nicely in that area between the Norwich midfield and defence - they're just struggling with that bit where you need to get into the penalty area. Martin Olsson has caught Bacary Sagna with an outstretched leg, but it's the Norwich man who's come off worse. He looks OK though. Wilfried Bony has made a right pig's ear of this. Youngster Kelechi Iheanacho feeds him in the area, but from 12 yards out Bony slaps it well wide. Best chance so far at a slightly sedate Etihad. Aleksandar Kolarov takes the corner. Nicolas Otamendi gets a head on it from round about the penalty spot - but it's straight at John Ruddy. It's all a bit pipe and slippers out there at the moment. Very pedestrian. Man City are prodding away. A harmless looking cross from Jesus Navas is put behind by Norwich's Robbie Brady when there was no need to. The grey sky is looking ominous above Etihad Stadium and, if you are a Canaries fan, so is City's early possession. Norwich are getting all their men behind the ball, no matter where it is, and I think that is the pattern set for this afternoon already. Teenage Manchester City striker Kelechi Iheanacho got the loudest cheer when the teams were read out earlier, and it is fair to say their fans are looking for a repeat of his full home debut against Crystal Palace in the Capital One Cup in midweek when he scored one and made two more goals. Iheanacho is ostensibly a number 10 today in his first Premier League start, behind Wilfried Bony, but the 19-year-old Nigerian has been the one sprinting on to balls behind the Norwich defence in the opening minutes. Despite barely seeing the ball, Norwich have crafted a couple of decent chances from the set-piece. Matt Jarvis's corner finds Alex Tettey in loads of space - but his half-volley is blocked. Jarvis swings it back in and Joe Hart has a flap, but Seb Bassong can't connect at the back post. A decent little bit of possession for Norwich now earns them a corner, as Martin Olsson's cross is nodded behind. First go at goal and it's from Man City. Wilfried Bony cuts in from the right outside the area and John Ruddy has to parry low down to his left. Only nine minutes gone, but this gives you an idea of what's to come this afternoon. Norwich are in a bit of a flap as Kelechi Iheanacho is almost on to a tame looking through ball, but it just eludes him. And then Sebastien Bassong has his own keeper John Ruddy working to pluck a spooned clearance out of the air. That was a rare touch for the visitors. Aleksandar Kolarov swings in a left-sided free-kick, which Norwich deal with. Robbie Brady, traditionally a left winger, is lining up in a right wing-back position for the Canaries. Is there a sense of trying anything to get a result from Alex Neil? More Man City possession and it's worked out to the right and Jesus Navas. The winger has a reputation for being a bit of a dodgy crosser - this cross finds nobody. Norwich get us under way. And we're off. Quote Message: I often hear people say in this situation: ‘They’ve got nothing to lose, why don’t they go for it?’ I stayed up in the Premier League with Wigan because of one goal, so goal difference can be massive. If you go out with that sort of mentality, maybe you deserve to go down. I often hear people say in this situation: ‘They’ve got nothing to lose, why don’t they go for it?’ I stayed up in the Premier League with Wigan because of one goal, so goal difference can be massive. If you go out with that sort of mentality, maybe you deserve to go down. Don't forget, you can get involved with all the football chat today by using #bbcfootball on Twitter. I'm very much looking forward to hearing from you. There have been 32 goals in the last six meetings between these sides. And that's including a 0-0 draw. They make the teams wait in the tunnel a fair old while at Etihad. 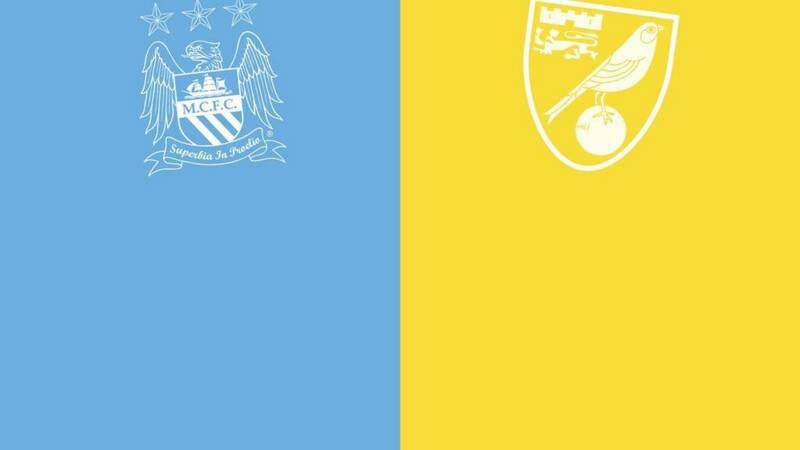 They will be able to hear Blue Moon being trumpeted out on the field. Actually trumpeted, by an actual trumpeter. Think you know your football? According to our league table, 15-24 year-olds are out in front when it comes to predicting the results of Premier League matches this season, just ahead of 45-54 year-olds, while the youngest (13-15) and oldest players (over 65) occupy the bottom two positions. Can you help change all that? Predict the outcome of the weekend's matches using the BBC Sport Predictor here. This is the first time Alex Neil has been under the cosh at Norwich. It will be interesting to see how he copes. It could be a memorable afternoon for Manchester City's number 76, Manu Garcia Alonso. "Manchester City are like a dog with a bone at the moment. That's the way they should be. Poor at Borussia Monchengladbach and against Sevilla, they won both games. "Defensively disciplined at Manchester United, they deserved the point. Imperious in the way they brushed aside Crystal Palace, they showed up fallen rivals in the competition. "This is not a good time for Norwich to go visiting. "The Canaries were squashed there 7-0 last season. It's four defeats in a row in all competitions this term and the longest winless run in the managerial career of Alex Neil. "He 'wouldn't say it is worrying times'. With Swansea, Chelsea and Arsenal to come after this, it could well be soon." Half-and-half scarves spotted outside Etihad Stadium. Half-and-half scarves. For a regular Premier League fixture. The game has officially gone mad. Five changes for Manchester City from their midweek League Cup win over Crystal Palace, while Raheem Sterling finds himself on the bench. Norwich are without injured right-back Andre Wisdom, so skipper Russell Martin is one of six changes from the penalty shoot-out loss to Everton this week. In-form team against strugglers? International global stars against plucky upstarts? Foregone conclusion? Probably. The last time Norwich went to Etihad Stadium they were tonked 7-0 (pictured). Premier League leaders Man City are the division's top scorers with 24 goals - the Canaries are the only side in the league yet to keep a clean sheet this term. But hey, if the result was already determined, none of us would have even bothered getting out of bed today.